News Supramolecular assembly on 2D materials: Can molecules interact across a graphene barrier? Directed assembly of molecules on surfaces occurs due to a combination of molecule-molecule and molecule-substrate interactions, and is utilized in the formation of molecular thin films for a wide variety of purposes. Molecule-molecule interactions involve electrostatic, hydrogen-bonding and van der Waals forces, whilst molecule-substrate interactions are typically governed by the electronic and topographic properties of the substrate. The crystal structure of the self-assembly, the adsorption energy, and the geometry of the adsorption are all heavily influenced by the substrate. Recently, the use of 2D materials, such as graphene, as molecular substrates has received increasing attention 1,2. 2D materials are characterized by strong in-plane bonding but only weak out-of-plane interactions. These weak interactions can be sufficient for van der Waals epitaxy whereby crystalline molecular films are grown with their orientation specified relative to the 2D substrate, but equally crystalline molecular film growth can proceed without an epitaxial relationship to the 2D layer 3, demonstrating the importance of the weak interactions between molecule and 2D substrate. Interestingly, at a single atom thick, graphene can be considered as both a 2D substrate and a membrane, with both top and bottom identical crystalline surfaces separated by only a single atom. However, graphene is impermeable to atoms and molecules, not even helium can pass through the lattice, which presents the intriguing question as to what extent interactions extend across the graphene membrane? Using a combination of low-dose transmission electron microscopy (TEM) selected-area electron diffraction (SAED) and scanning tunneling microscopy (STM), we study the molecular level structure of self-assembled nickel(II) octaethylporphyrin (NiOEP) on metal-supported and freestanding graphene. 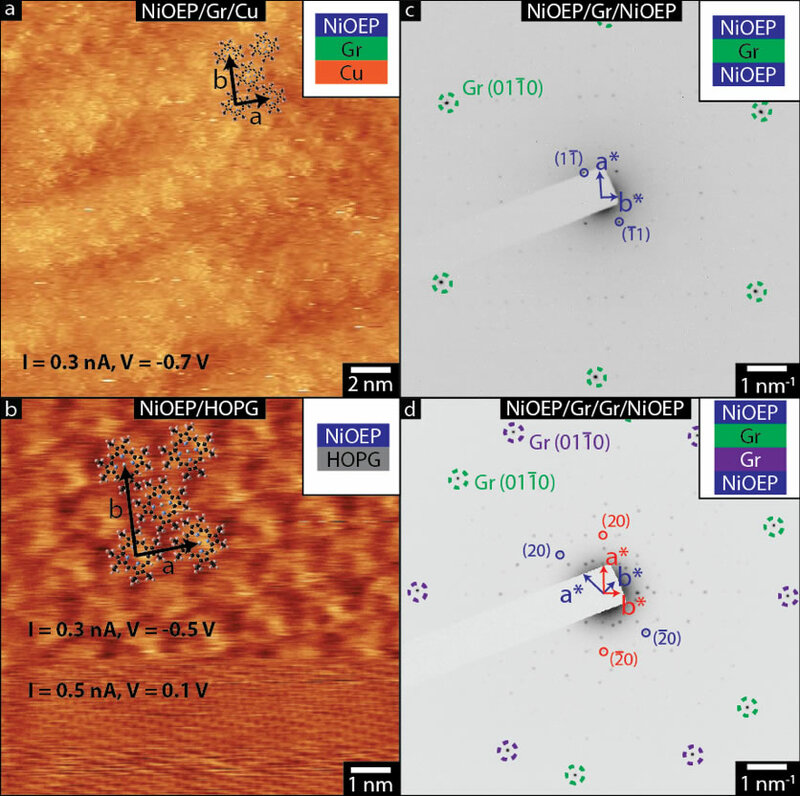 STM measurements reveal that NiOEP assumes a flat 2D lattice on both copper-supported graphene and on HOPG, in agreement with previous measurements 4. SAED measurements of NiOEP deposited on both the top and bottom faces of a suspended graphene membrane reveal the same 2D molecular lattice, with spacings of (2.31±0.01) nm by (1.52±0.01) nm and a lattice angle of (89.5±0.1) °. There is no epitaxial alignment between the graphene lattice and the molecular layers but, crucially, the two molecular films on either side of the graphene are aligned with each other. By contrast, when the molecular layers are separated by two layers of graphene, they are randomly oriented with respect to each other and with respect to the graphene. The same results – ordered 2D molecular layer on each graphene surface, but aligned only when separated by monolayer graphene – are found for self-assembled octaethylporphyrin (OEP) without a metal centre. These results demonstrate that graphene is at least partially transparent to molecule-molecule interactions, but these are rendered ineffective once the barrier width is increased to two layers of graphene. This new phenomenon of molecular alignment through 2D films gives a new tool for the study and design of nanostructured films, and demonstrates how molecular interactions can extend across the otherwise impermeable graphene membrane. Figure 1: (a) STM image of NiOEP deposited onto copper-supported graphene with unit cell parameters marked. (b) STM half-and-half image of NiOEP deposited onto HOPG with unit cell parameters marked. (c) SAED pattern taken from NiOEP deposited either side of a single layer of freestanding graphene. Graphene (green) and NiOEP (blue) reflections are marked (d) SAED pattern taken from NiOEP deposited either side of two randomly-oriented layers of freestanding graphene. Graphene (green, purple) and NiOEP (blue, red) reflections are marked, revealing a random epitaxy between NiOEP and graphene layers. Macleod, J. M. & Rosei, F. Molecular self-assembly on graphene. Small 10, 1038–1049 (2014). Zhou, Q. et al. Switchable supramolecular assemblies on graphene. Nanoscale 6, 8387 (2014). Ogunrinde, A., Hipps, K. W. & Scudiero, L. A scanning tunneling microscopy study of self-assembled nickel(II) octaethylporphyrin deposited from solutions on HOPG. Langmuir 22, 5697–5701 (2006). We'd be pleased to help you find the best products for your needs.